It's been just over a week since I returned home from the long anticipated Sew South Retreat 2014 in Charlotte, North Carolina. I can't possibility express how much fun and inspiration I've experienced at Sew South the last two years. Best of all are the friendships that I have made. It's hard to believe how such strong bonds can be forged in a few short days, but I am lucky to have made real friends from all across the country at Sew South. Thanks to apps like Instagram and Flickr, we can keep in touch on a regular basis, and share the projects we are working on and the important things happening in our lives. 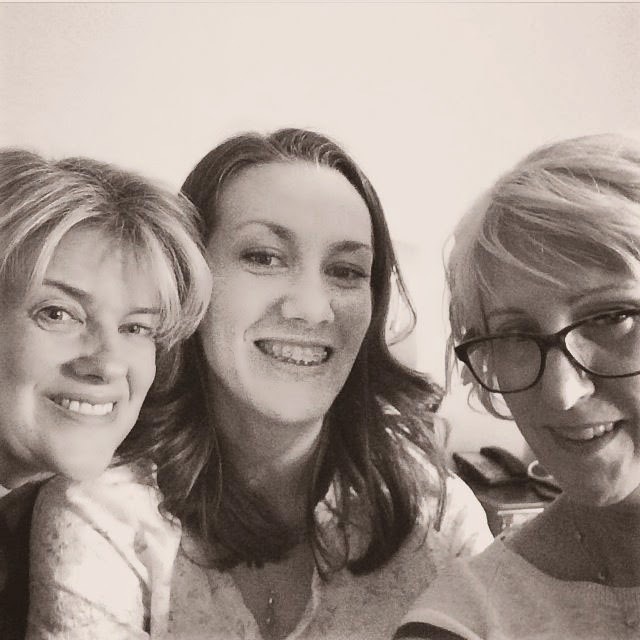 I love these girls, and I eagerly look forward to the next time we meet! All of my Sew South photos were taken with my iPhone, and I'm sad to say that I didn't take many pictures (particularly with all my pals). 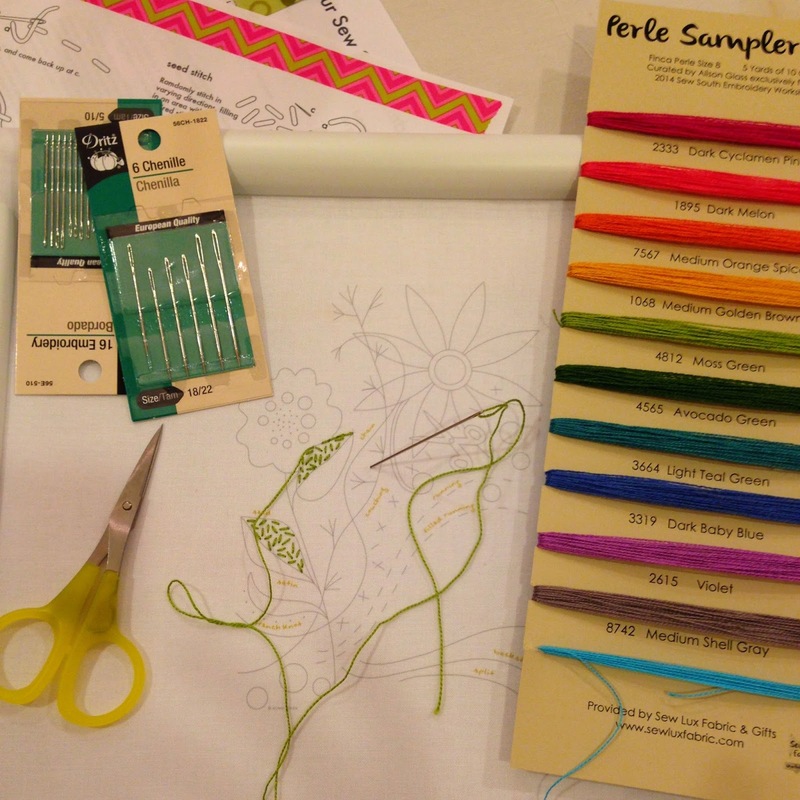 Here's a quick peek at the fabulous Sew South Retreat from my perspective. Night of arrival - happy reunion with two gal pals from last year, Cindy & Diane. 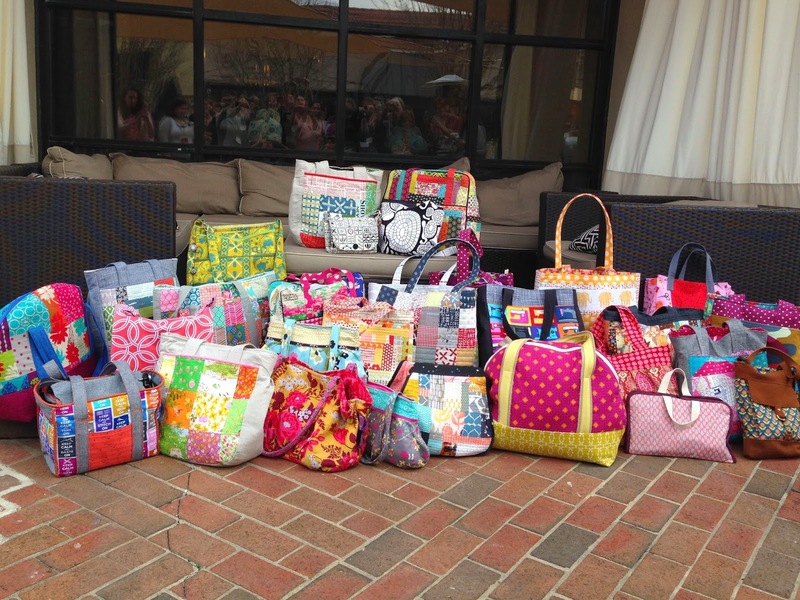 It was easy to pick out all of the arrivals at Sew South, because everyone carried at least one handmade bag. These are just a few of them. 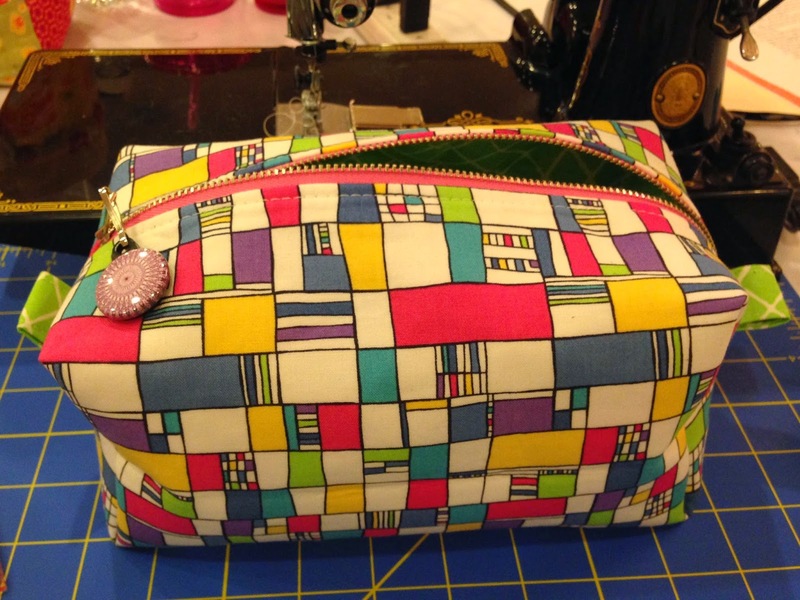 This is the boxy pouch I made during our project class with Kelly Bowser. It was a fun, quick project, and I'm sure I'll make more of these awesome pouches. 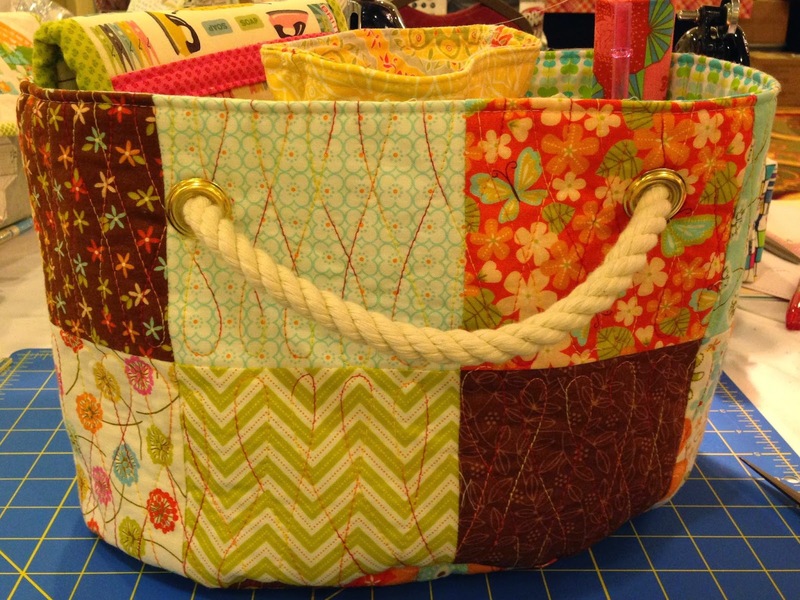 Here is my scrap bucket from our class with Heather Valentine. I'll definitely be making more of these. We even got to go outside and play with hammers to install the grommets! The blogging class with Christen Barber was very informative, and I learned some important points to remember when using pictures. Kati Spencer's class on improv was amazing. She brought some of her quilts to show, and they are gorgeous. I, however, have not yet finished my improv pillow project. I think I spent too much time chatting. Neither have I finished my embroidery project from our class with Alison Glass. Yikes! Here is the start (along with the Perle Cotton that was generously donated by SewLuxFabric and needles from Dritz). I have completed a tiny bit more of this project than pictured, but this is on my to-finish list (along with the pillow) for the next week or two. I LOVE Alison's embroidery patterns (in fact, I bought more). She is so very talented and nice. She also talked with us about her fabric design process, which was awesome! One of the best parts about my Sew South experience this year was having the BEST Secret Sister in the WHOLE WIDE WORLD!! Ironically, Karen was one of the first new gals I ran into at Sew South. My roommate and I immediately started referring to her as "Cool Karen." 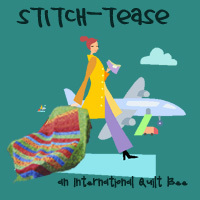 She traveled to Sew South with her bestie, Shirley, from Michigan. Although we are technically neighboring states, I'm sad that Wisconsin and Michigan are separated by that hugely inconvenient body of water called Lake Michigan. :*( Otherwise, I would be visiting these two at least every other day. Karen made me that fabulous mini dwell…along with all of the things shown below. And all of this wasn't even everything she gave me!! She was such a generous secret sister, but more than that…she is AWESOME! I'm so glad to call her and Shirley my two newest friends. 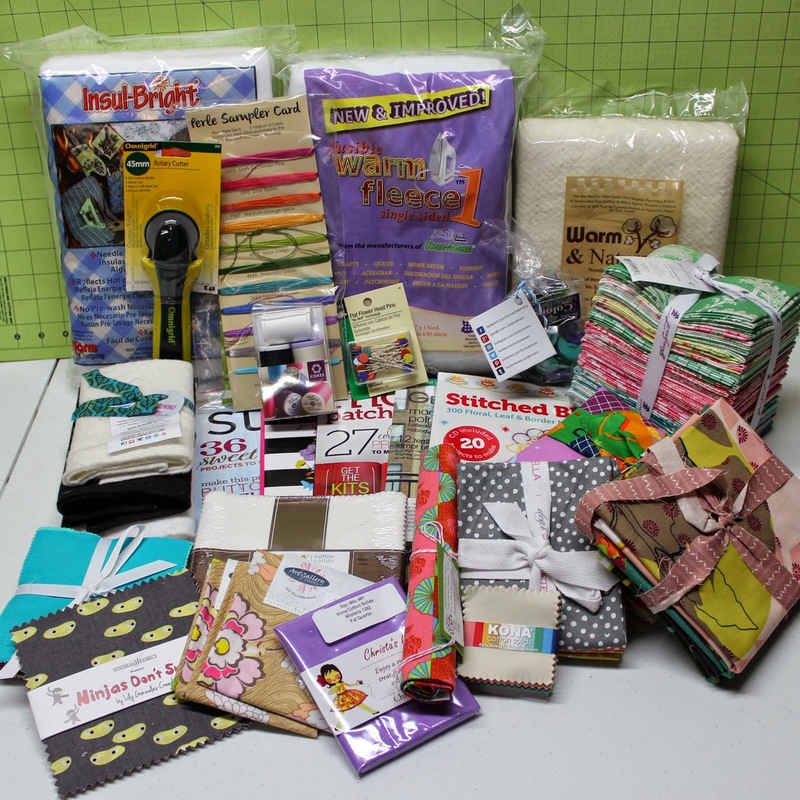 I was lucky to be Secret Sister to an awesome gal I had previously met at Sewing Summit, Tracey, from California. It was fun getting to know Tracey better, making her gifts, and trying to figure out things she might like. She is so upbeat, funny, and lovely. I'm glad I got to be her secret sister! Here she is with the Noodlehead Super Tote I gave her as a final "reveal" gift. At the very end of the weekend, just before we all said our goodbyes, we gave Jennifer a surprise thank you gift for being so dang fabulous. 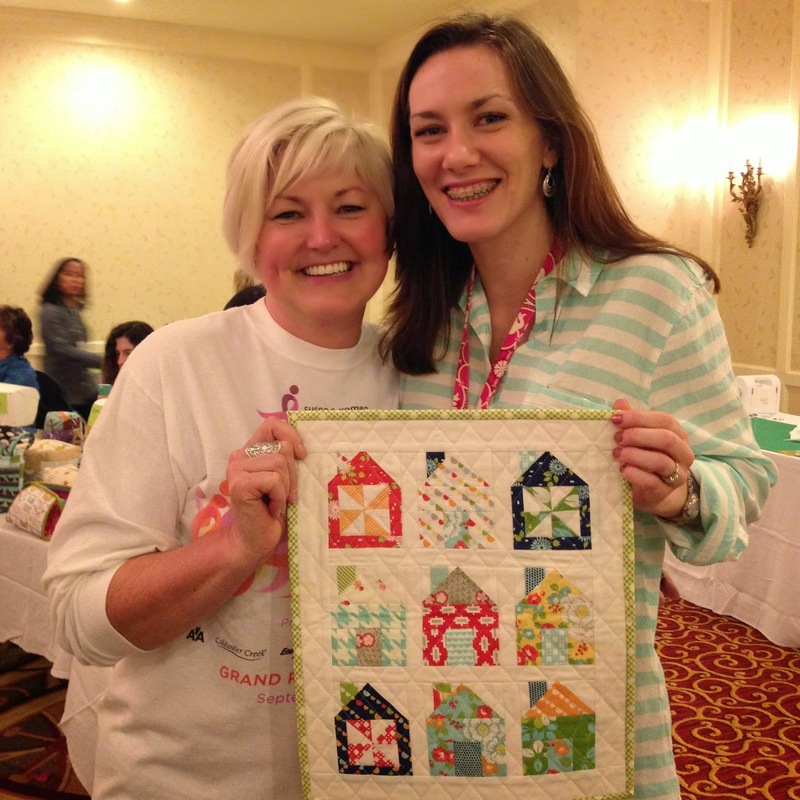 Fellow Stitch Tease member and friend, Valerie came up with and coordinated a super-secret-surprise-project that we all pitched in and made for Jennifer leading up to Sew South. 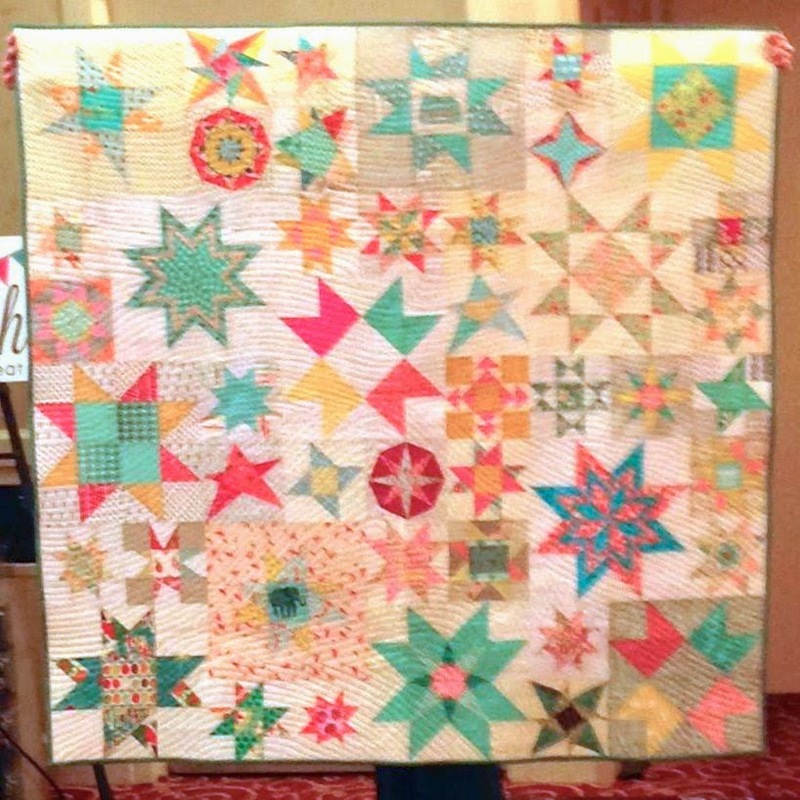 Over 40 gals made random star blocks in Jennifer's favorite colors, and sent them along to Valerie. She then put them together and made a quilt. The picture I took was from far away, but here it is in all it's glory. I think it's safe to say that Jennifer loved the quilt. There was definitely some "ugly crying" going on. One last picture that truly portrays the joy we felt at Sew South. No fake smiles here! I already can't wait to go back! 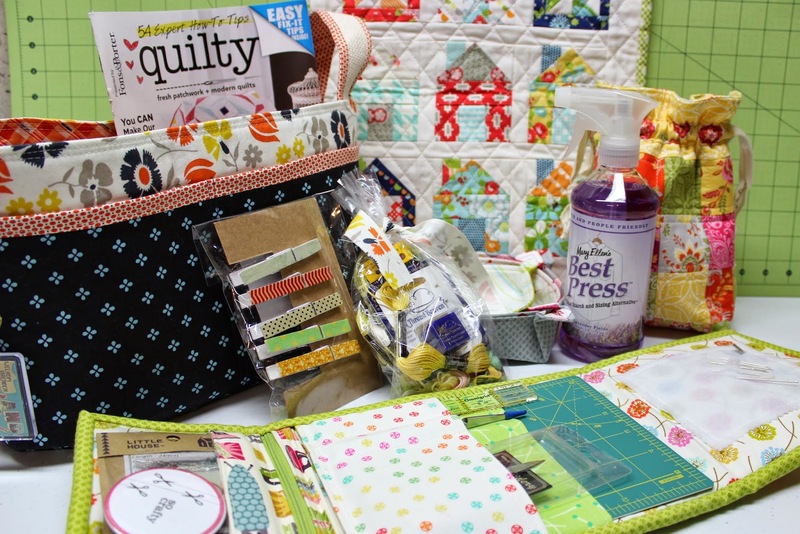 Jennifer is giving away some more Sew South swag to a couple lucky winners on April 5th. Click here to visit her blog and enter to win! Sew South Retreat 2014 Sponsors!! Awesome! It looks like you had a great time! 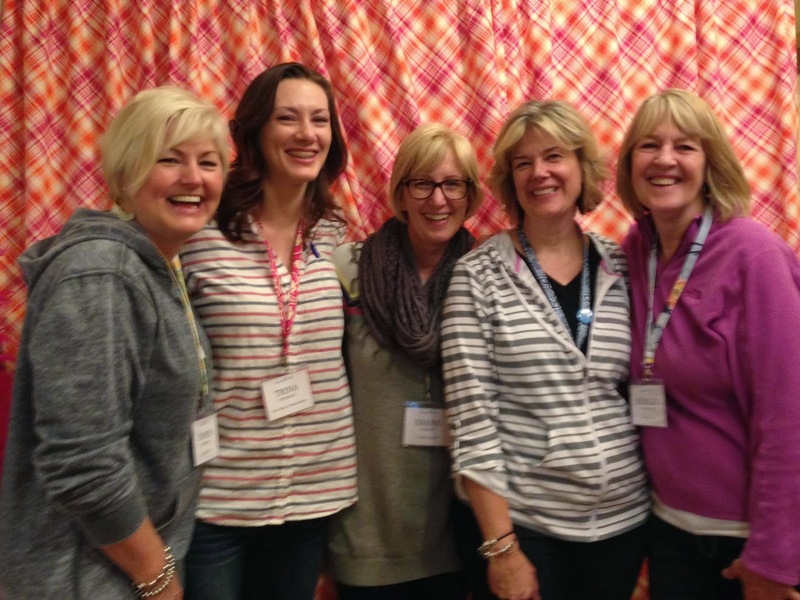 It's obvious you all enjoyed each other and had a wonderful experience at Sew South this year. So happy for you. Enjoyed your blog. Was so great to spend time with you in Charlotte-it wasn't nearly enough time though! Great write up-looking forward to next time!